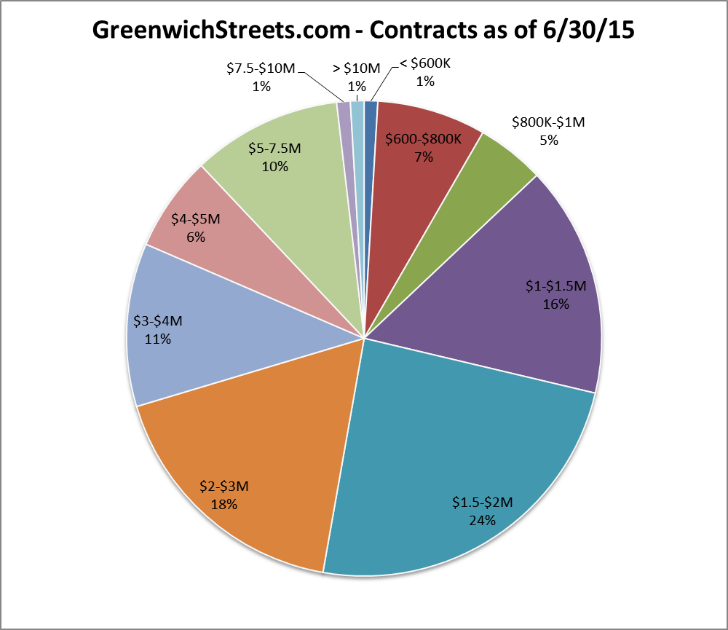 Contracts were down at the end of June so July was not likely to be a stellar month and it wasn’t. We only had 71 sales reported by the GMLS last month. We’ll get a few late sales reported and seven to 10 private sales, but even if we get to 84 sales we will still be below the 98 sales in July 2013 and the 95 sales in July 2014. We will get to our 9 year average of 73 sales and June was a stellar month. With a little time shifting between months we have two above average months. The good thing is we still have 103 contracts waiting to close. So August should look better than July. Our inventory is slipping a little which is typical of this time of year, but in the price categories over $1.5M we have good supply. What has been our super-hot category may go to just hot in August as we have more contracts from $1.5 – 2.0M than from $1.0 – $1.5M. We also have a nice number of contracts from $2 – 4M. So we will see the average sales price rise as more sales happen above our average sale price of $2.46M. Our median sales price is $1.875 which is a nice increase from last year. Even though sales dropped back to our 9 year average in July from stellar 2013 and 2014 July the sales distribution and demand stayed the same in most price categories. The main exceptions were the $7.5 – 10M and the $600K – 800K price range where July sales were 1 sale and 6 sales. Now the fact that one sale can get the annualized months of supply for July sales to drop 21 months shows just how slow this segment has been. The median house in Greenwich has 3,266 s.f., 4 BR, 3/1 BA on .44 acres. It sales for around $1.87M or $574/s.f.. It takes about 3 – 1/2 months to sell and goes for 94% of its original list price. It has appreciated nearly 20% from the last tax assessment in 2010 or about 4% a year. even Citarella home of the $24/lb cherries has pretty decent prices on sushi. 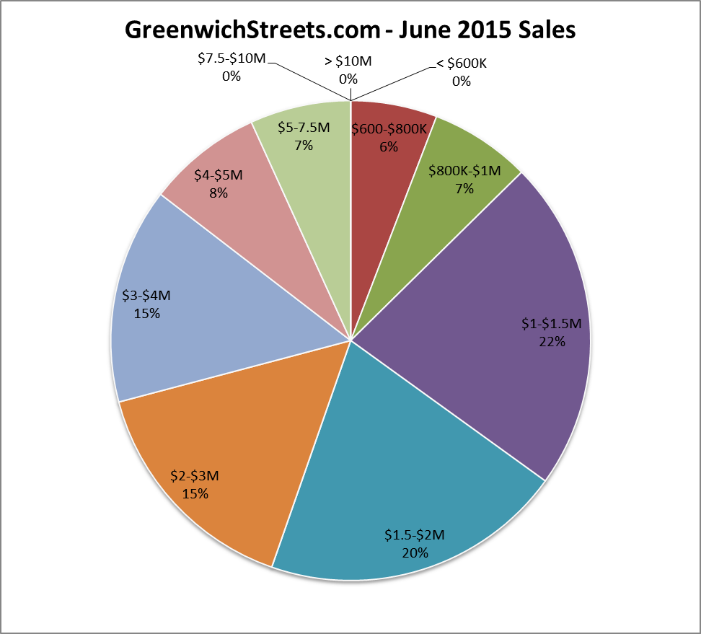 We had an amazing 110 sales in Greenwich for June 2015 an increase of 22 sales over June 2014. 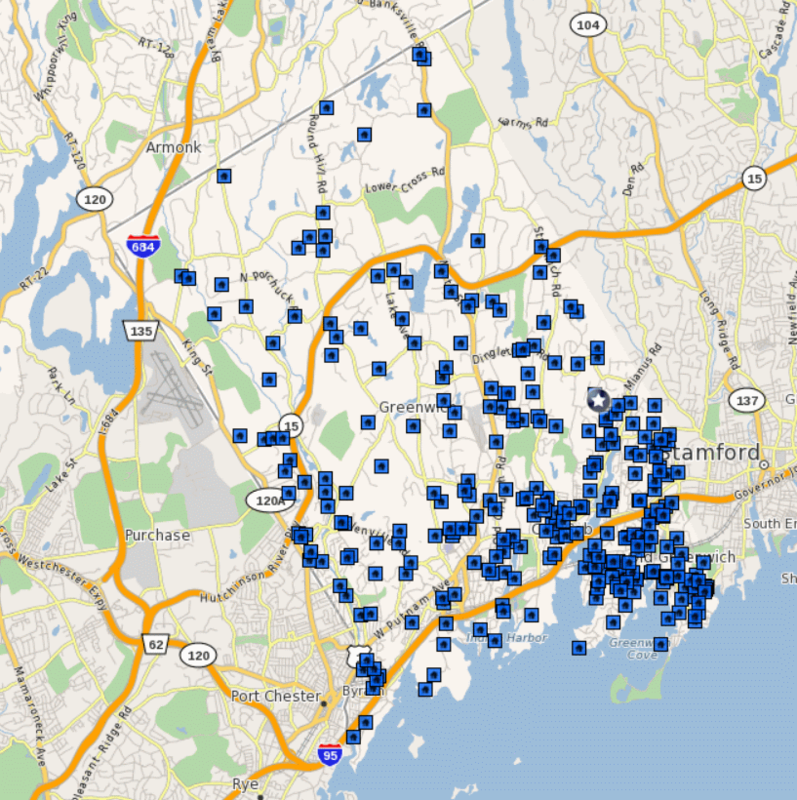 This would be a record except for the 114 sales that we had in 2011 when the Connecticut Legislature raised the conveyance tax effective 7/1/11 resulting a June boom and a July 2011 bust. Inventory is also good at 592 single family homes on the market which is 21 more than we had in 2014 at this time. We still could use a lot more inventory under $1.5 million where buyers have limited choices particularly on the east side of town. Inventory from $1 – 1.5 million is up 15 houses from last year but contracts and sales are up 20 houses from last year so we are getting houses coming on, but they are going off equally as fast in this hot market segment. < $600K 4 1 0 1 12 13 2.0 2.3 #DIV/0! $7.5-$10M 24 1 0 1 3 4 48.0 45.0 #DIV/0! > $10M 55 1 0 1 3 4 110.0 103.1 #DIV/0! Our over $7.5 million market has plenty of inventory with 79 gorgeous houses available. The disappointing factor is that only 8 houses are under contract or have been reported sold on the GMLS. This present a major buying opportunity as prices in the ultra-high end in New York City are drastically higher on a price per square foot basis. So inventory is good and sales are up, but that is the 20,000 foot view. When you get down in the weeds and look at particular price ranges and neighborhoods the story can be quite different. For example from $7.5 – 10 million our inventory is down 12 units from 36 listings to 24 listing; a drop of one-third indicating a tightening market. Sales however have been down slightly and contracts up slightly showing a neutral market, but overall this price range stays as a strongly pro-buyer market. < $600K -4 -4 -3 -7 0 -4 -2.00 -1.22 #DIV/0! $7.5-$10M -12 1 -1 0 -2 -1 4.80 -9.00 #DIV/0! > $10M 0 -4 -1 -5 -6 -10 73.33 73.66 #DIV/0! The driving force in our market continues to be the segment from $1 – 2 million which is up 38 sales over last year. (We also have nice bump up in sales and contracts from $4 – 7.5M up 10 houses over last year. The chart above shows numbers with a green background that are pro-seller; such as lower inventory, higher sales and contracts, and lower months of supply. The pro-buyer segments are the opposite and are shown with a red background. From $600,000 to $4 million our inventory is up 41 houses, which shows a willingness of sellers to put their house on the market, which wasn’t the case earlier this year as the harsh winter kept inventory off the market. Our 2015 spring market started late again. As to what’s coming up, July 2015 is likely to return to the traditional pattern of being slightly down from June, even though 2013 and 2014 July sales tied or exceeded June sales. The reason is the number of outstanding contracts is down 34 houses from 2014. All in all though 2015 is shaping up to be a good year in line with 2013 and 2014 and maybe even a little better, it’s looking more and more like the new normal or around 700 sales though each year seems to have a different mix of hot price segments. We have 3.8 months of supply from $1 – 1.5 million which is astounding. We have a hotter market there than we have from $600,000 to $1,000,000, not that these markets aren’t plenty busy. This competitive buying continues all the way up to $2,000,000 which is still better than the $600K – $1M market. In this price range many of the buyers are young families that buying before the rates go up even higher. The other big factor in this market is pent-up demand being released as downsizers particularly from Westchester, jump into the market in this price range. Another sweet spot for sellers is not quite so obvious. Our months of supply from $4 – 7.5 is improved over last year as contracts are up as well as sales. We should see a smooth curve of increasing months of supply from our lowest price range to our highest, but the buyers are out there in the $4 – 7.5M price range. Once you hit $7.5 million, however, buyer demand has stayed light. The good thing about the high-end price range is that we are looking like a bargain to NYC buyers. Our price per square foot is often a fraction of what some condo buyers and investors are paying in New York City. We are seeing more Asian investment groups and Silicon Valley types expanding their businesses in the area. 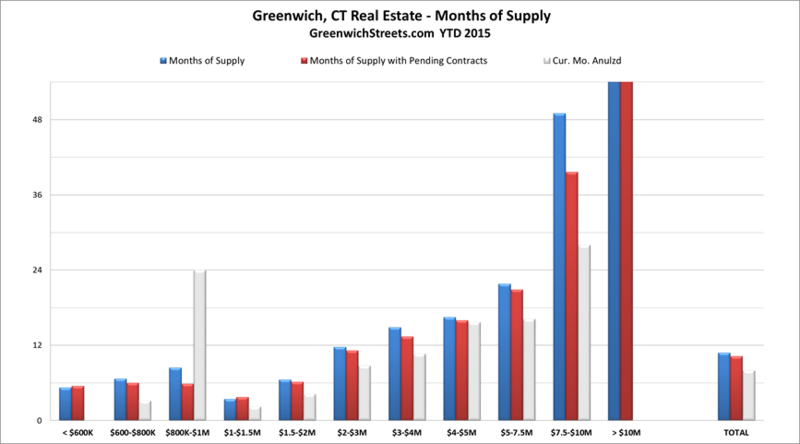 For both these groups Greenwich’s upper end is looking like a good place to invest. 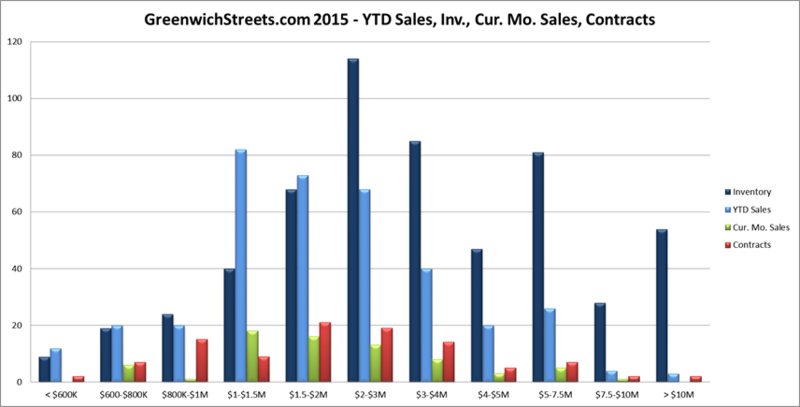 Another way to judge a hot market at mid-year is whether sales for the first six month exceed inventory. Sales clearly have exceeded our present inventory from $1 – $1.5M and also for our under $600K market. Under $600K is a shrinking market in Greenwich as most of our single family homes have appreciated beyond the $600K price range. The result has been an increase in sales of condos as reported in a recent Bloomberg article (where I got quoted :). 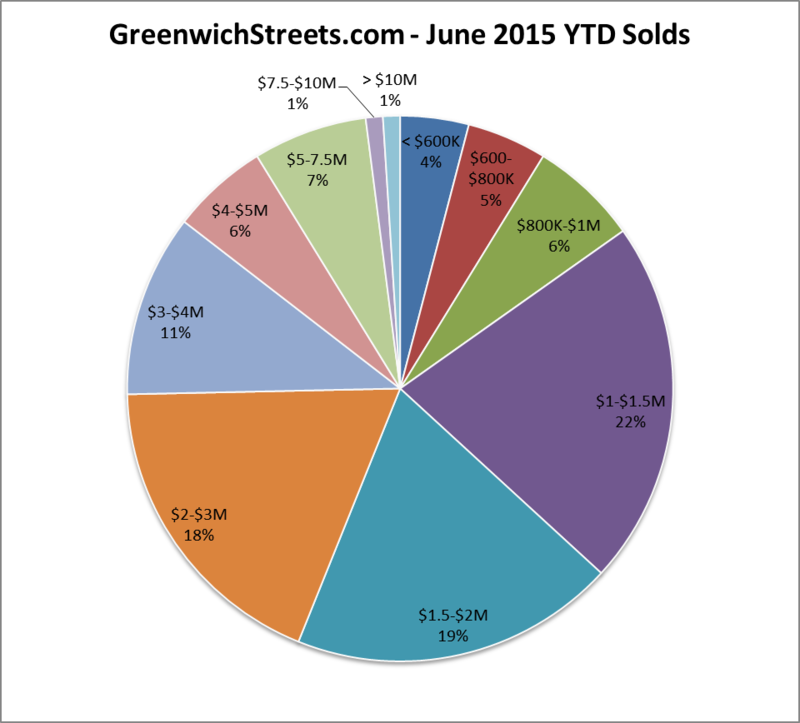 June sales of 110 GMLS and private single family home sales in Greenwich were way up over our 9 year average of 85 sales. 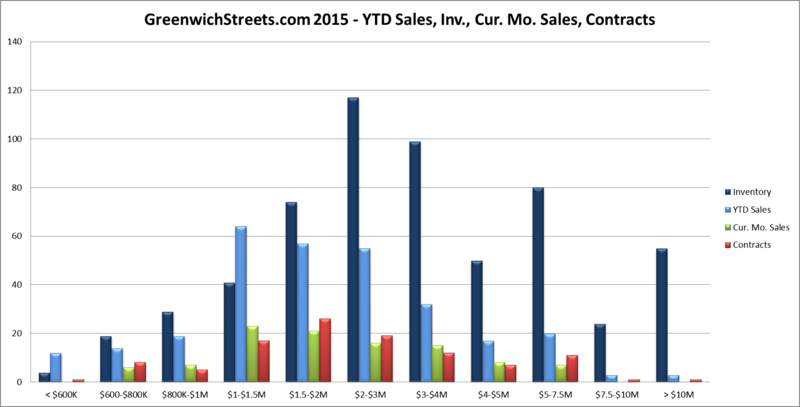 The really impressive thing is that just the GMLS sales this year exceeded GMLS and private sales for 2014 and 2013. The total of 110 sales falls just short of the June sales of 114 set in 2011. That month is an anomaly, because the conveyance tax was set to increase on July 1, 2011, which shifted sales into June. That sales spurt in June 2011 was followed by a bust in July 2014. This increase isn’t like that it is a real market driven increase. You can see just how busy the $1 -1.5M market is when you compare the size of the purple pie section for inventory (7%) to the purple section for YTD solds (22%). The blue pie sections show how the next price range up, $1.5 – $2M, has been busy too with an inventory of 12% while sales are 19%, i.e. sale are 50% more than inventory. This section will get even larger as 24% of our contracts are in the $1.5 to 2.0M range. 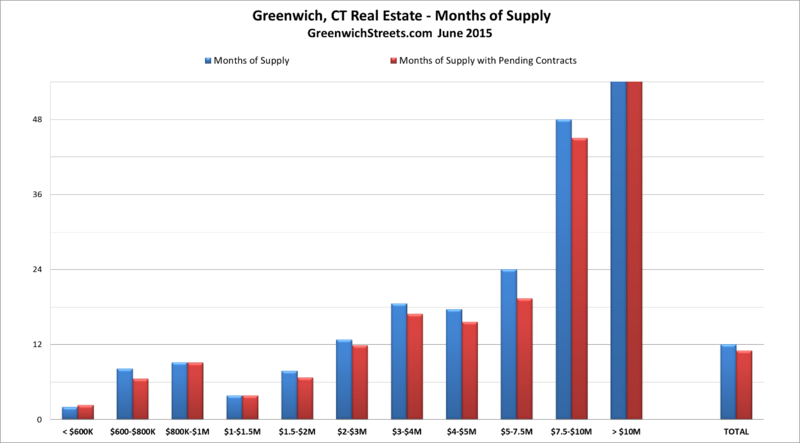 Old Greenwich, Riverside and Cos Cob are doing well. Mid-country is moving along and builder activity is strong. Back country particularly those sections not near a Merritt Parkway entrance or I-684 are slower and present some real buying opportunities particularly for downsizers where commuting times are not as important.